I tried to guard my mind away from these thoughts still no use...such thoughts were stepping in time to time...however I was very clear I am not going to give any importance to such silly thoughts any more, what that means no expectation of any surprise, no expectation of any calls, no worries if few of my close pals have forgotten to wish and so on. Such a feel, calmness was very much sublime under the armor of a married woman. 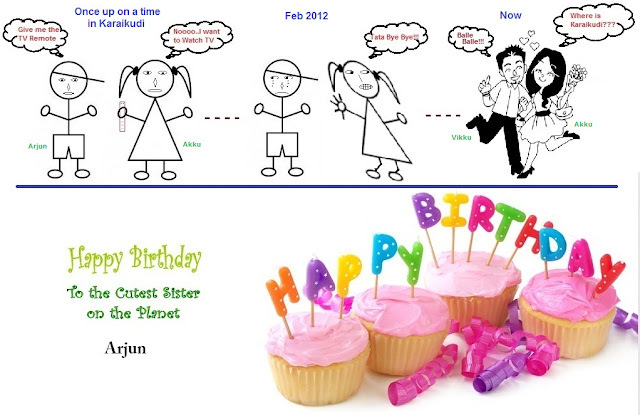 And so on I felt I was gradually transforming into a woman from the state of a young crazy girl. Then started coming the duties of being a married woman. The month being Sharava considered a very auspicious month, I had to get started with my first Choodi Pooja that’s normally offered to Tulasi plant by all married women belonging to Konkani brahmin community. What this means, one needs to offer Poojas to Tulasi on Friday and Sunday the entire month, making choodis, prasadas and exchanging choodis with other married women, the elders and seek their blessings. For making Choodi , one needed to get some Flowers, few wild grasses as main particles and few other sacred decorative items and tie them as a bundle and offer to lord Tulasi. Now that I live in a township, where at first place I did not have a tulasi plant at home, flowers were not easily available in market as in bengaluru, and many such items needed for the pooja were not easily available and also could be that I was lazy I gave up the thought of making any effort to perform the Special choodi pooja at home. Also since it was my first choodi pooja after wedding, as per the tradition, I should have got started with the same in a grand manner either at my in-laws place or my home. Since we stayed far away from both the homes, our parents as well did not force us to come either for performing the same traditionally. When I learnt choodi pooja symbolizes the feelings of woman being complete in her married life, I could not refrain any further. Soon I sought my husband’s help for getting the needed items home for pooja...The day I decided to perform the pooja, I was really surprised to see my husband get Tulasi plant home that night itself on his return back home from office. For a minute I did think, if you think it is not possible, it is not possible for sure. That is if your mind cup is full, you would for sure have no space to think about the feasible possibilities. 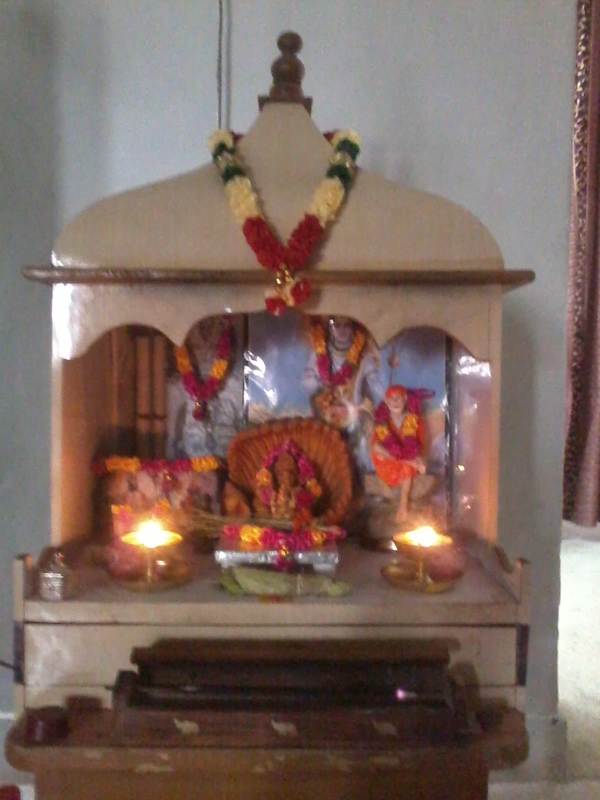 Next couple of days the way my pooja room got ready for the pooja ignited me even more spiritually. What if the flowers were not easily available in the market, I did get some artificial mini garlands home for decoration and I started feeling slowly the grace of God on us. The moment tulasi came home, I felt even the little negative energy prevailing at home was out in no time. Here I point the balcony at the back of our house close to our kitchen that was occupied by Masakalis and family as in most of the big buidlings, consequently dirty with their shits all around. Although this was unpleasant I had not tried to get rid of the pigeon family.Also since it was at the back of the house and was not required much, it remained the shed for doves, cutting away some beauty of our house. However when tulasi plant came home, it was required to keep it a airy place with less but considerable sunlight. To top all these when it was THE DAY for me when Choodi pooja also had to get started, I felt so divine starting my day with Tulasi pooja, seeking blessing from my husband. That moment when I fell on my husband's feet and he laid his hand on my head to bless, I felt very much complete as a married woman and blessed by God. 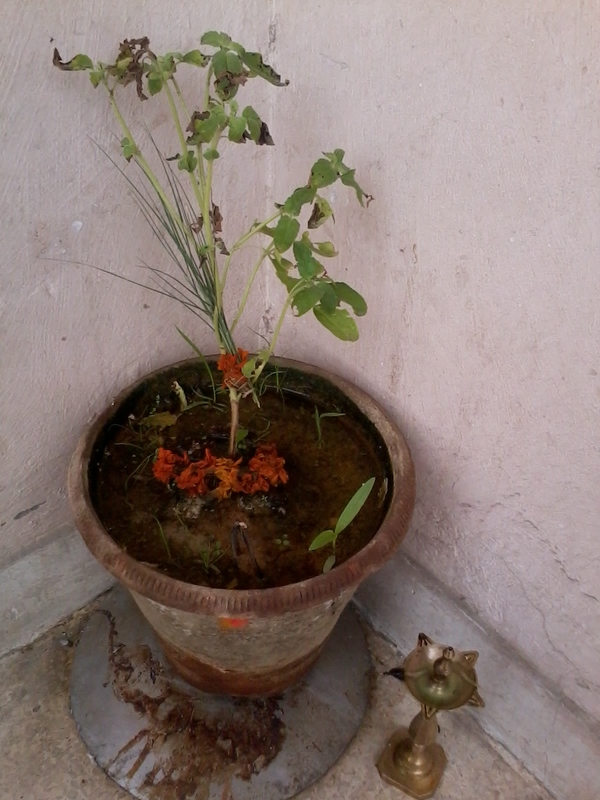 The day was truly Godly with Tulasi pooja setting in on my birtday and making it very blissful. Thanks to all my friends and family members for wishing me, blessing me and adding more sweetness to my joy!! It's been 2 weeks now, since choodi pooja is being celebrated with lots of devotion and joy, and as per my mom's advise finally we had Tulasi plant at our house after 6 months of our married life, by which time we had bought all the essential household items but had forgotten Tulasi!! When time comes and God's grace is on us, all good happens automatically!! Above experience might sound silly for few but a strong belief for me! !